The feeder also sends you notifications and takes consideration of your pet’s age, weight, and activities to control the amount of portions and ingredients of your pet’s food. Not only that, it can monitor the amount of pet food that you have at home and also has your food restocked and delivered when you’re running low. If you’re worried about being unable to supervise your pet’s feeding, and wondering if your pet is getting enough nourishment during their feeding time, then this product is ideal for you. Because it can be connected to your smart phone, you can now monitor your pet’s feeding time even when you’re at work or away from home. 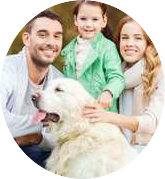 The system also takes your pet’s profile into consideration in order to provide your pet with ideal ingredients and serving portions.